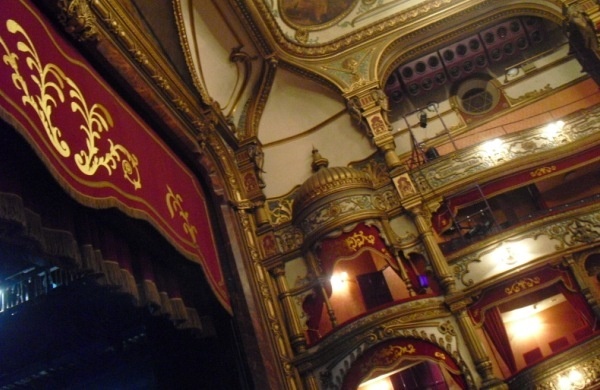 The Grand Opera House is one of Belfast’s architectural treasures. Sitting on Great Victoria Street its front façade is a beautiful example of the work of architect Frank Matcham. 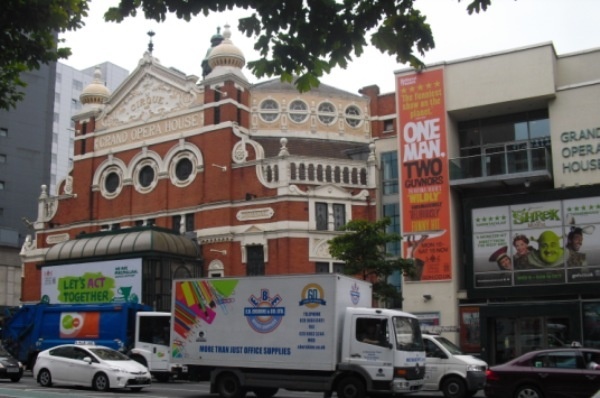 It has undergone many refurbishments as part of its 119 year history from re-naming to repurposing as a variety hall, cinema and theatre. Now the theatre hosts large scale shows in its expansive auditorium, musicals, ballet and touring shows from the West End. When the theatre underwent its most recent bout of refurbishment in 2006 it both added square footage and divided opinion. The refurbishment saw greater access for patrons and the addition of a studio space, called The Baby Grand, additional hospitality areas but primarily more space. The addition of the large extension onto the building has been the subject of much debate, with some suggesting that architecturally it should be more in line with the original turn of the century style, while others see the new extension as of its time and a sharp modern juxtaposition to the period style of the Opera House. It is definitely worth a visit to see how to two periods combine. The interior of the Grand Opera House is split into the theatre itself and the refurbished multifunctional areas where sheets of glass and stone are raised three storeys into the air. This has made the venue so much more accessible for disabled patrons and provided much needed lingering space for patrons to enjoy a glass of wine and soak up the atmosphere. The theatre is one of the best surviving examples of the oriental style to be found in the United Kingdom and its gilded boxes rise up to the painted ceiling, all framed by the magnificent proscenium arch. Guests to the Opera House should try and see how many elephants they can count hidden throughout the auditorium. Previous performers on its stage have been greats such as Laurel and Hardy, George Fornby and the very first UK debut of a young Luciano Pavarotti in Madame Butterfly, guests have even included General Dwight Eisenhower and Field Marshall Montgomery in 1945. Now though the theatre is usually filled with the enormously successful touring shows which come from London including many award winning productions which fill the seats from start to end. The Baby Grand, as its name would suggest is the smaller black box style multipurpose space which is used for workshops, performances and even movies allowing both spaces to be occupied by very different styles of production. The Grand Opera House is a gem for Belfast, both visitors and residents should experience a performance in the auditorium as the architecture is utterly unparalleled. The most stunning performances are the Christmas ballets which are a must, the magnificent space of the auditorium and the magical space of the ballet creates an out of body experience in the audience. This should be on everyone’s bucket list. Find a deal for things to do in Belfast.